Friday morning four intrepid travelers depart for a weekend in Lanquin and Semuc Champey: Manuel of Quetzalroo, Katrina of Australia, Lucas of Switzerland and your humble and sometimes corny writer. Our destination is deep in the highland jungles of Guatemala. Our friendly taxi deriver Otto, aka Mario brothers, takes us to the bus station where we board a Pullman bus for the four hour ride to Coban. In Coban, we provision and then grab the last shuttle to Lanquin, a little over an hour’s ride over some rough roads. Now this shuttle has maybe seats for 18, all taken, with several already standing. Manuel admonishes us to, “shove your way in. This is the last shuttle.” Now I have rode some crowded chicken buses but never have I been sardined this tight. In retrospect, even the Cairo buses seem roomy by comparison. Lucas counts 40 passengers; how he can see them to count is beyond me, but he is young and tall. I am standing with one foot mostly on the floor, totally wedged into place. After 30 minutes or so, my leg fatigues and somehow I slide/bump down to a sitting position on the floor with bodies still standing all around me. I have the thought that if I pass out or die, no one will notice until we disembark. The thought passes and I begin to see the twisted humor in this situation. An eternity later, we arrive in Lanquin. It is dusk and getting dark. We disembark and my legs quickly revive. We set off on foot, Manuel in the lead, and are soon on a dark path surrounded by jungle. 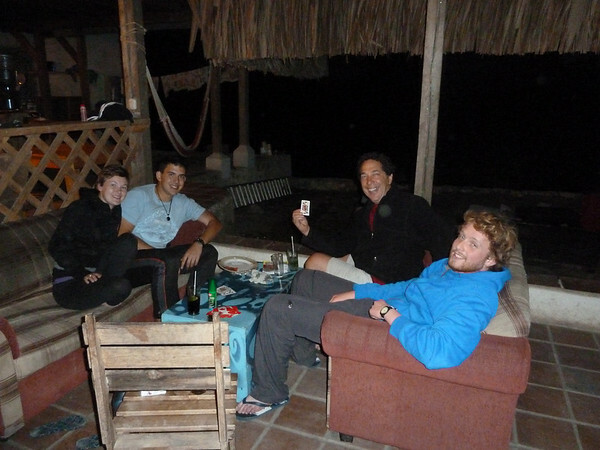 We continue, by flashlight, for a few minutes, accompanied by the sounds of birds, monkeys and assorted unknown fauna. 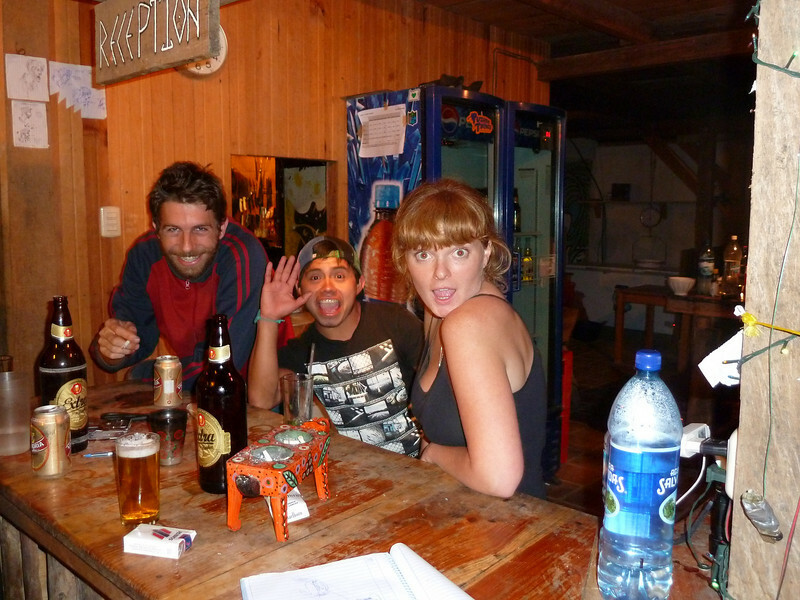 And then, we suddenly arrive at Zephyr Lodge, an incredible hostel in the middle of nowhere. There is a busy restaurant and bar, all open air with a thatched roof. 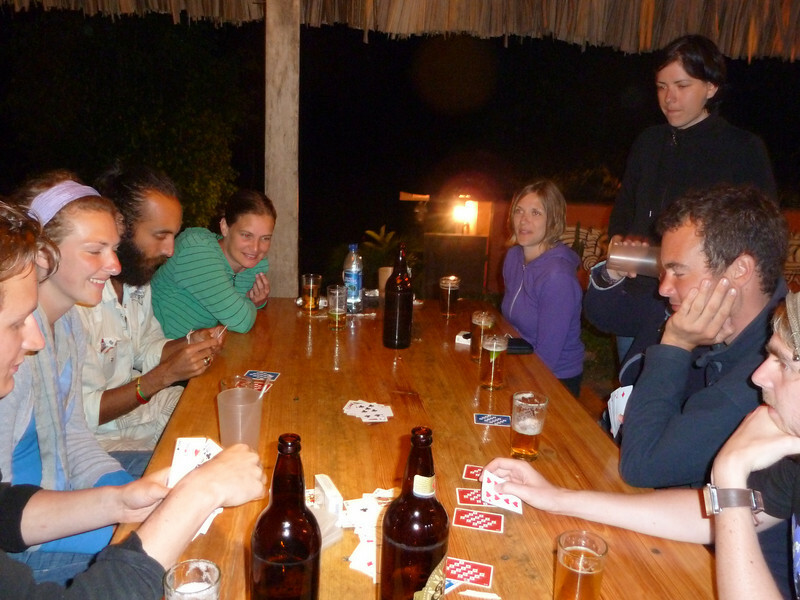 An international mix of backpackers, flashpackers and assorted folks are chilln’, playing cards, on their laptops, et cetera. There is a satellite dish and a 1TB music collection powering the place. Talk about a frequency band shift! The funny thing about this game is everybody changes the rules a bit. Large Groups Can Play Shithead Too! We eat, we chill awhile, and then it’s off to our beds for some well deserved rest. We wonder what tomorrow will bring. Awesome, Philip! Sounds like a really fun adventure w/ some new buddies. You’ll have to teach me how to play shithead card game when you get back!! It’s really fun, especially with four or more. Me too! I want to learn how to play shithead! We’ll see if you still can remember when you get back home. No problema. Suministro el vino. Your best post yet my bro, I can tell you are in a different groove now and I am appreciating your band shift. Gracias and pura vida. I am working on Part 3 right now. I appreciate your fine-tuned frequency read. Yes, I am getting muy tranquil.